Our facility is equipped with 5 of the latest technology in golf simulators and 6 practice range simulators from U.S and Korea. We provide a World class recognized accurate simulator from Full swing golf and entertaining simulator from Family golf. 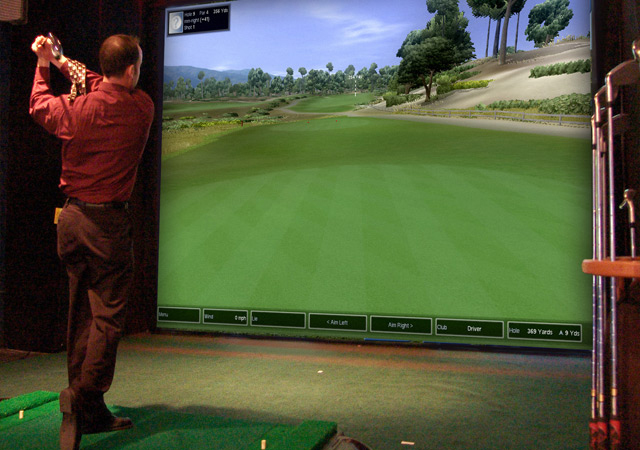 This System introduces 6 simulator golf ranges called “eye shot” with swing analysis camera which offers you a lot more than targeted net practice range can offer. Combining ultra-high resolution graphics with unequaled ball flight tracking, the golf simulator meets &exceeds your expectations for performance, accuracy, realism &endurance. Whether you are playing, practicing, or fine tuning your equipment, these simulators will improve your game from tee to green. 67 Breathtaking and challenging golf courses from around the world are available, including Pebble Beach, Oakmont, and The Old Courses at St. Andrews. Every tree, bunker, and patch of grass has been painstakingly placed, bringing out the subtle, and not so subtle, nuances that make each course a unique work of art. For more informati0n, call us at 905 470 – 7768 or visit our website.